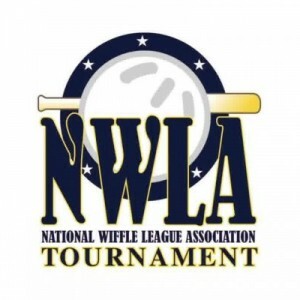 Potomac Wiffleball League: NWLA Performance: Better to be Lucky than Good? NWLA Performance: Better to be Lucky than Good? The Chris Gallaway era is over. Chris successfully piloted the NWLA Tournament from its birth until the point we’re at now (likely its death). In his wake lies one of the biggest unanswered questions of his tenure: Who was the biggest underachiever and overachiever in the Gallaway era? Lucky for you, I’m here to answer that. The math supporting my findings is riddled with questionable logic and outward biases, but that won’t stop me from making sweeping generalizations. Yes, you’re correct. I arbitrarily defined a lot of these variables. “Why is someone with a 1:1 K/BB ratio and 3.01 ERA not considered a ‘good’ pitcher?” Because I said so. The world has cutoff points (that 3.49 GPA ain’t gonna get you Latin honors, son), and so do I.
I used this model to “predict” the outcomes of the past tournaments. The model is fed the data for each team in each year’s tournament, and it spits out what place it thinks that team would have finished in each year’s tournament. So for a team to “overachieve”, that means that it placed higher than the inputs would have suggested it would place. Likewise, an “underachiever” is a team that placed lower than the model predicted. I suppose I should make one methodological note. I first ran a model for the pool play portion of the tournament. Based on those results, I then ran a model on the double elimination tournament. So the model is biased towards teams who perform well (i.e., throw good pitchers) in the pool play. 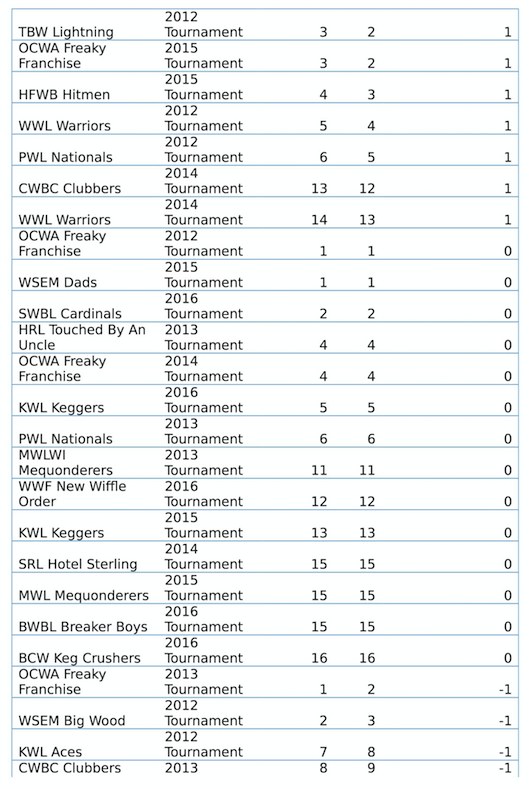 Teams who save their arms for the double elimination tournament are generally undervalued by the model because their pool play pitching weighs down their pitching numbers. So who is the most overachieving (or luckiest) team of all-time? 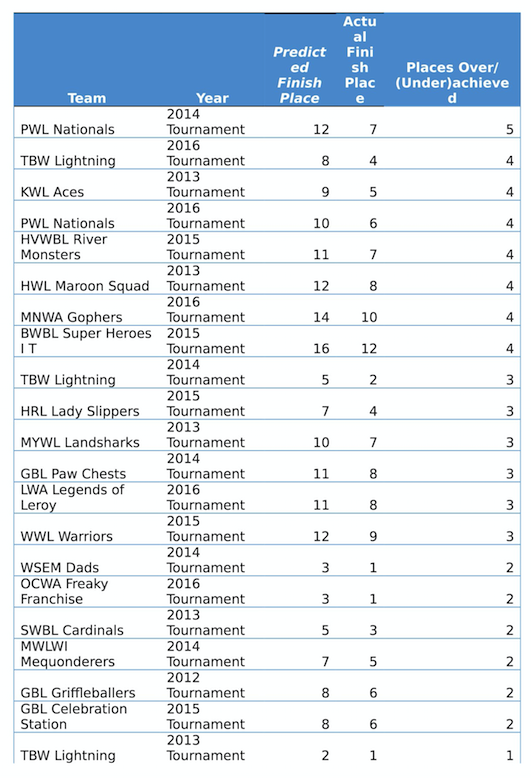 Well, it’s none other than the 2014 version of the PWL Nationals In fact, the PWL owns the top 2 overachieving performances of all-time (well, we’re tied for 2nd with 6 other teams). Let’s be very clear what this means. You’ll notice that outside of TBW, none of the “overachievers” ever really make a push to win it all. It’s a lot easier to outperform expectations when no one expects anything out of you. When they perform well (PWL included), it’s generally because they avoided a “stopper” (Bush, Farkas, etc) in the 1st round. The overachieving teams are also more likely to rely on 1 pitcher. So since they generally save him for the DE tournament, their overall team pitching statistics suffer since he doesn’t throw in the majority of the games, causing an underestimated value in their pitching in the model. I suppose there’s a way to correct for that, but I don’t want to try to find out how. The biggest underachiever/unluckiest team of all time? WSEM in 2013. I mean, who can blame them, though? They had to face the good Shannon in their elimination game. 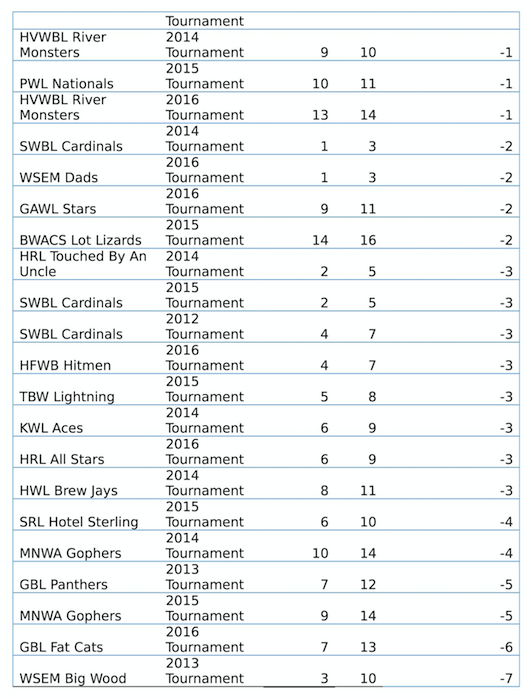 Again, it should be noted that because WSEM has the deepest stable of arms, their pitching stats throughout pool play are outstanding. So the model expects a lot out of them going into the double elimination tournament. The other team with big disappointing finishes? GBL. This is in line with what I’ve long believed: they should be a regular challenger for a top 4 spot. What has hurt them? In 3 out of 5 years, they had to play an elite team in the 1st round of DE. I’m not sure what the model sees in MNWA. They draw walks at a very good clip, which is the most statistically significant variable for performance in pool play, so I suppose that’s what is driving up their win expectations. Of course, anyone with eyes doesn’t think they underachieve. It can justifiably be claimed that for a given year, all this model does is measure luck, and I’d probably not disagree too much on that. Getting lucky on who and when you play certain teams generally separates the 8th place team from the 12th place team. But the idea is that evens itself out over the years, and if a team consistently outperforms expectations, that may be evidence that they generally have figured out a strategy to win that compensates for their lack of statistical prowess. Can it have something to do with the managerial talents? Let’s look at the average performance by each team for every year they participated. The extremes on this are teams which have only played 1 or 2 years. Due to their smaller sample, the “luck” has not yet evened out, so they’re going to stand out. But for the most part, teams generally finish right around ( +/- 2 spots) where the model predicts. The takeaway? Was Gallaway actually a good manager? 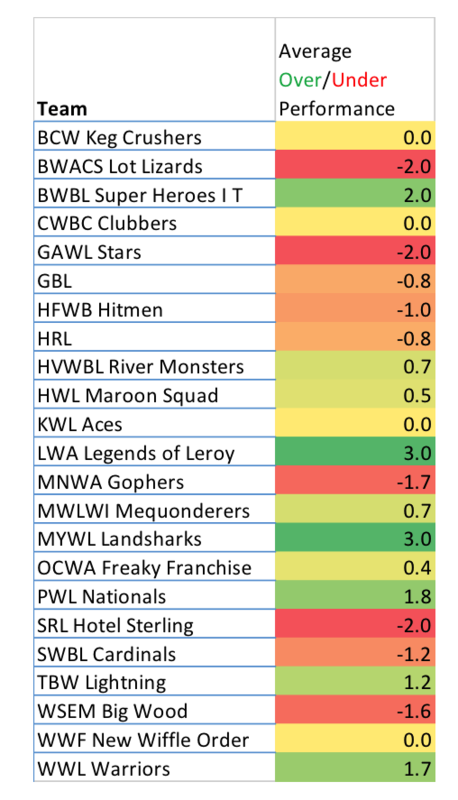 Of the teams who have played multiple years, PWL is the one who most outperforms its expectations. No, that can’t possibly be it. I’ve said for years that Chris was in over his head as a manager. I can’t be wrong. As my parting gift to Gallaway, I’d like to tell him that his tenure as manager of the PWL was not as apocalyptically bad as I’ve made it out to be. Don’t get it twisted, it wasn’t great. Your best year ended in a 7th place finish. I mean, you’re kind of the Dusty Baker of wiffleball. But I want you to know that I don’t totally blame you anymore. You can sleep easy now; I know it kept you up at night.